These Joe Biden Memes Mocking Trump Are Killing Me! 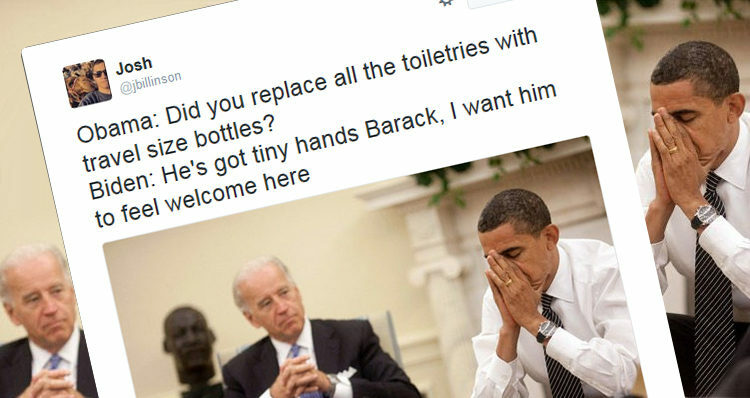 You gotta love Joe Biden – and these memes are cracking me up. An amateur photographer based out of the Washington D.C. metro area named Joshua Billinson has become the latest Twitter star with his Joe Biden memes. In the wake of Hillary Clinton’s stunning defeat, Billinson has taken to his Twitter account, publishing a series of memes focusing on Vice President Joe Biden’s response to a Trump presidency. In his memes, he covers a wide range of topics from Trump’s leading role in the birther movement to Trump’s tiny hands and ….. There are several that cover a hilarious range of practical jokes being played on Trump by Biden. Biden: "Guess who just upper-decked the toilet outside the Oval Office?"